11am – 4pm, Tuesday 23, Wednesday 24 & Thursday 25 April. This Easter holiday the Darwin and Pride Hill, Shrewsbury Shopping Centres are celebrating the upcoming launch of, Marvel: Avengers End Game, with three days of awesome Superhero-themed family fun – to keep your wannabe superheroes entertained! They will have super-special guests swooping into the Darwin and Pride Hill – with a visit from Ironman on Tuesday and Spiderman on Thursday, who will meet and greet guests and pose for a selfie or two. Find them on the lower level of the Darwin Centre and the Top Level of Pride Hill at intervals throughout the day! Master all your super-skills through our assault course and enjoy our superhero pants challenge, flying lessons and kryptonite disposal masterclasses. 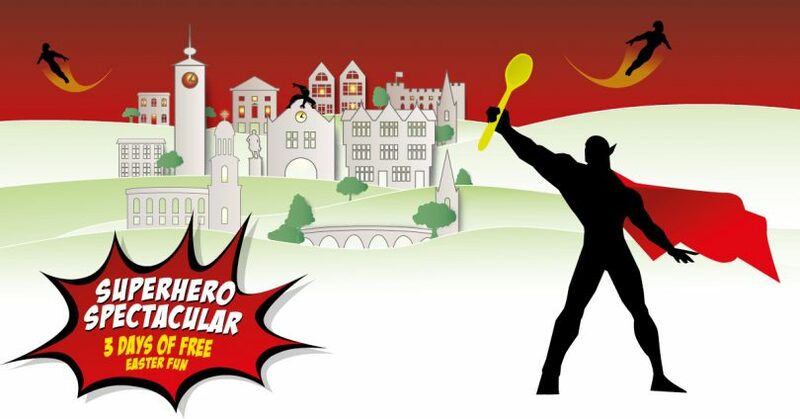 Get stuck in with our crafty supplies to create a superhero spoon puppet to take home or jump into our puppet theatre to create your own show! Get creative, designing your very own cape, complete with personalised superhero motif! Then swoosh your way, fighting crime and saving the day. Find out more about Shrewsbury Shopping at the Darwin and Pride Hill Centre website.